This is my entry for the Sunday CAS challenge over at The Outlawz. The twist this week was Full Moon. My husband and I were coming back from shopping the other night (the night of the full moon) and when you get to our street, there is a stoplight. To get to our house, we turn left, but while sitting at the stoplight, if you turn your head to the right and look at the other side of the street, this is what you see. There are 4 of most beautiful palm trees lining your way up the street and there was the full moon right above them. I immediately thought of this challenge. All of the images are from Doodle Pantry. I actually used 3 of Laurie's sets to create this scene. Palm Tree, Golf Ball (for the grass) and Christ's Gift (for the boulders) . One of the reasons I love digital stamps so much is the versatility you have when creating with them. You can size them, rotate them or remove portions to fit your needs. I used the main image of the Palm Tree set and copied it for times, staggering them up on an angle. Two of the trees were flipped horizontally to give it a more natural look. I cropped the grass from the Golf Ball set so place around the base of the trees and then took the boulder's from the Christ's Gift set to place between the trees. The lines for the median they are on were added with the line feature, but would also have been easy to do using a ruler and micron pen. I printed the image on white glossy card stock and then sponged with various inks. The moon is a circle punch, sponged with blue ink. The sentiment is a rub-on. I added a little bit of white gel pen to highlight the trees, grass and boulders. Beautiful card. That moon was awesome! Susan you did an amzing job combining images! This card is just stunning with the moonlight and slight reflections. Wow is all I can say. Oh, this is a stunner Susan - reminds me of Hollenbeck in West Covina. That street was lined with sago palms in the 1980s when we lived there. They were just regal, as is your card!!! This is gorgeous. Her trees almost look like our Palmetto trees and our symbol is the Palmetto tree and cresent moon. Wow! This is gorgeous! I would love to live where Palm trees grow. Love how you combined all of the images! 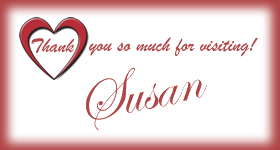 Stunning, Susan! Love the way you did the moon. Incredible! Wow awesome card - love how you used 3 different sets to make this stunning card. Wow! Gorgeous moon, gorgeous night, gorgeous palm trees! Only you would think to add "boulders" and grass, to make it more realistic. Sheesh, you had me at the fantastic MOON! I can't believe how realistic the moon looks...I think I can see craters on it!! LOL I am in "awe", Susan. I am getting pretty excited about digital stamps, and all that can be done with them. Who knew? Well, they picked the right person to showcase their stamps, I am thinking. I just can't believe how effortless you make it seem. Thanks for sharing and especially for the full descriptions! Kudos! Wow - this is sooo amazing - stunning effect! OMG I LOVE IT Susan! I've got to case this I hope you don't mind! Gorgeous!